Lately, Tenali Raman has been making more enemies than friends because of his popularity. 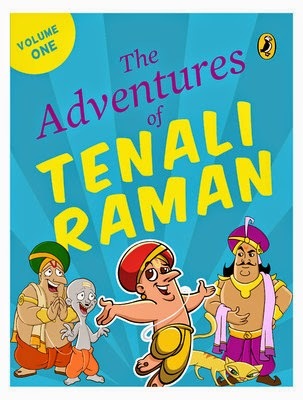 Join Tenali Raman and his friends in this book as he tries to teach his enemies a lesson with his intelligence and wit. Tenali Raman may be the favourite court jester in the Kingdom of Vijayanagara, but that has not been of any advantage to him when it comes to the number of enemies he has. Read this book about one of the favourite jesters of all time, and learn about his origin and adventures that include the Persian elephant that is a glutton and the flying machine that goes out of control. Have fun with Tenali, his cat Sundari, the silly Tingary and some unusual, but loyal, friends of his. Learn to use wit and humour in putting your enemies down. Toonz Animation India Ltd. was established in the year 1999. It is an animation production division of Toonz Group. As part of the Indian animation industry, it has emerged as one of the biggest production houses in India. It is also among the most admired. The clientele of the animation house include: Walt Disney, Turner, Nickelodeon, Sony, Universal, BBC , Paramount, Marvel and Hallmark. Author: Tooz Animation India Ltd.